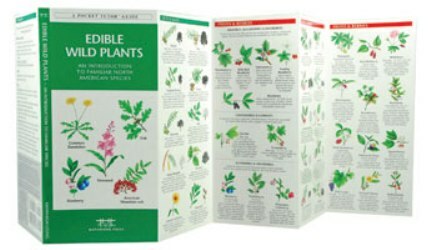 Pocket Naturalist: Edible Wild Plants, 2000, by James Kavanagh, illustrated by Raymond Leung. Compact, laminated nature guide, profusely illustrated in color. Shows over 100 familiar North American species of nuts and seeds; fruits and berries; leaves, stems and bark; roots and tubers; desert and tropical plants; seashore plants; and poisonous plants. Folded to 4” x 8 ¼,” opens out to six 4” panels.